Finally! The April 2013 Dress! Introducing - the April 2013 Dress! 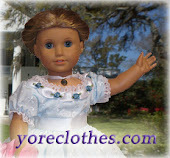 Doll Clothes of Yore has just been able to release the April 2013 Dress - a beautiful Victorian Wedding Gown! Taken from an illustration from 1849, this beautiful dress and veil make the perfect bridal ensemble! Go to the dress page to read more about Queen Victoria's wedding gown, and the traditions she set in 1840! Where is the April dress?? Some of you have probably been wondering "Well, it's April now, and March has ended. Where is the April dress?". Well, the answer is... it's coming. I have something very special planned for the April 2013 dress, and unfortunately I'm still waiting on things to come in the mail for it. But since today is April 2nd, I thought I'd give you a little sneak peek. 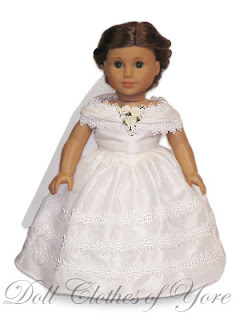 For those of you who have wanted to see a period Bridal gown... your wait is almost over! Since April's birthstone is the Diamond, and I like to match the monthly dresses to the birthstones, I thought it would be lovely to have a period wedding dress or bridal gown as the monthly dress. Unfortunately, I don't know when I will release this dress since I am waiting on the Postal Service to bring me what I need! But in the meantime, I'm sure there are enough lovely outfits in the Spring 2013 collection to keep you interested for a while!